Find another way across the Thames River for the next month in Chatham. A full closure of the Fifth Street Bridge starts at 7 a.m. Monday and runs until about May 13. All lanes on and beneath the bridge will be closed to vehicle traffic for the entire duration of the project. The Thames River will remain accessible for boats and pedestrian access points will also be in place. According to Chris Thibert, director of engineering and transportation, the closure is connected to vandalism earlier this month. “In an effort to ensure the security of the bridge, the safety of pedestrians and on-site personnel, the Fifth Street Bridge will be closed to all vehicular traffic,” said Thibert in a statement. The bridge first closed in July 2017 and was set to reopen at the end of December 2017. Construction delays pushed back the opening date, and contractors had to pay penalties for missing completion dates and the bridge stayed closed until June 2018. Work on the bridge has continued since then, with various construction fencing restricting full access. 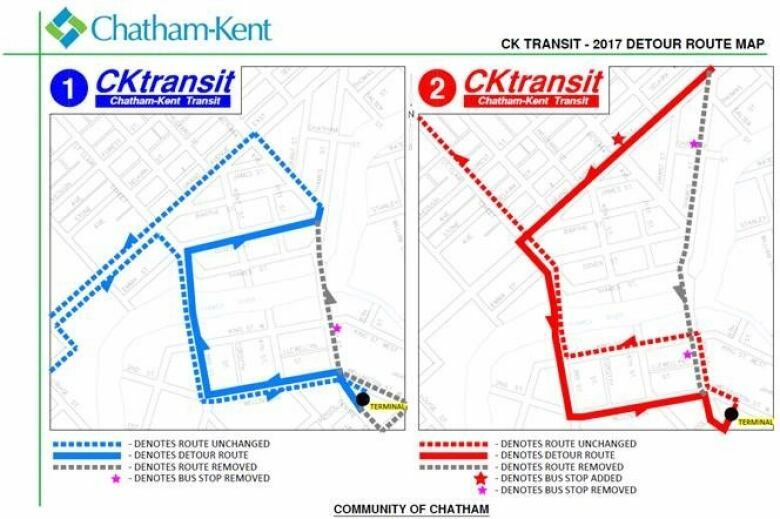 During the closure, CK Transit 1 and 2 will be on a detour route.